Christa is having a ‘quilt-along’. 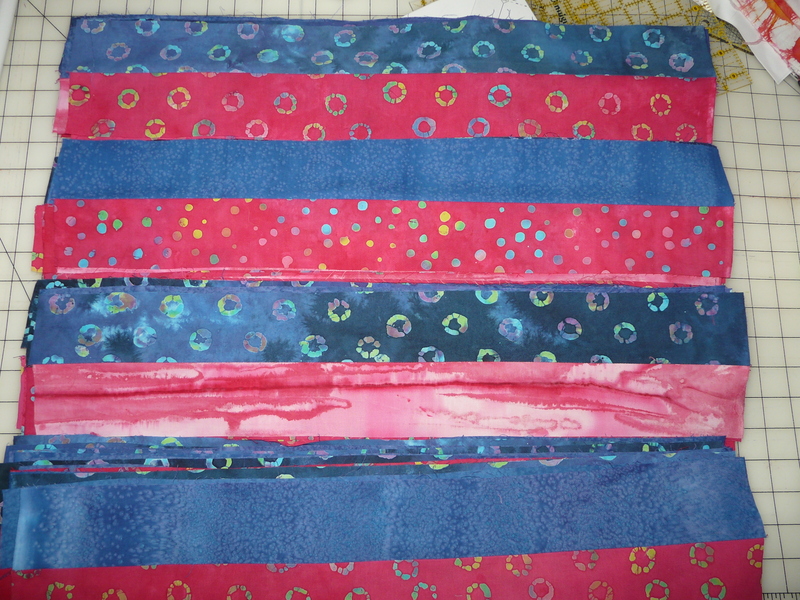 Normally, I don’t join in on these things, but I had this jelly roll that’s been gathering dust for quite some time. So has everything else, but we won’t get into that. I also dug out some leftover fabric for the extra yard that was needed. 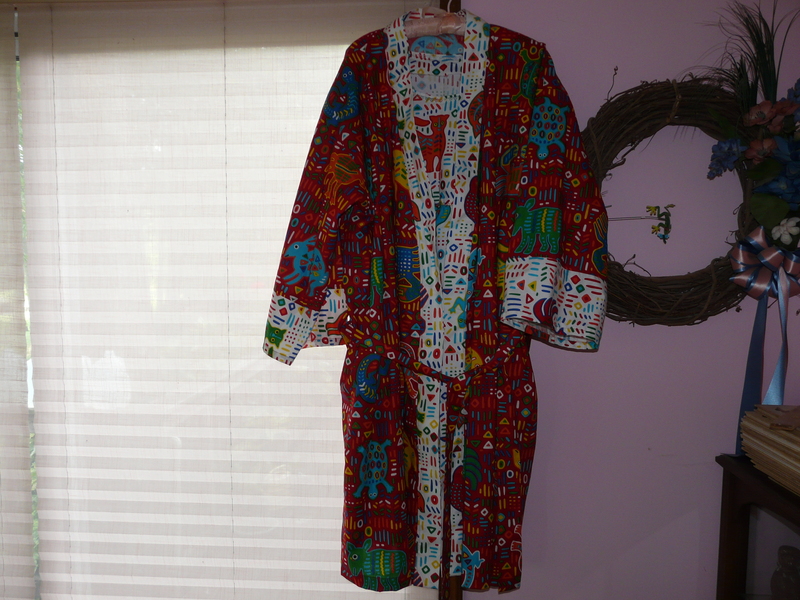 It also gave me the incentive to finish my robe. The jelly roll I had is basically two colors so I went with a paisley print to pick it up a bit. 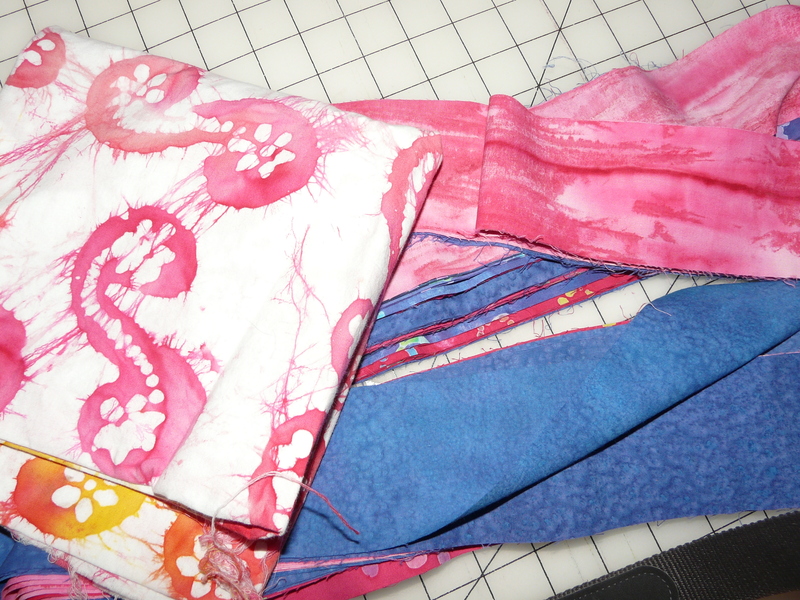 I have sewn all the strips together. I laid them out to get a good look. I’m just getting all warm and fuzzy with it. I think I may have to go my own way on this. Sometimes, I like to make egg salad. But Sweetums thinks it’s gross and disgusting. What does he know? He’s from Oklahoma. Well! I’ve come up with the perfect solution. And we both get what we want. I hard boil two or three eggs and make myself an egg salad sandwich. There is about enough left for half a sandwich. I get out a can of tuna ( Have you noticed that they are getting smaller?) and dump it in the egg salad. Sweetums says it’s the best tuna salad he ever tasted. Go figure. 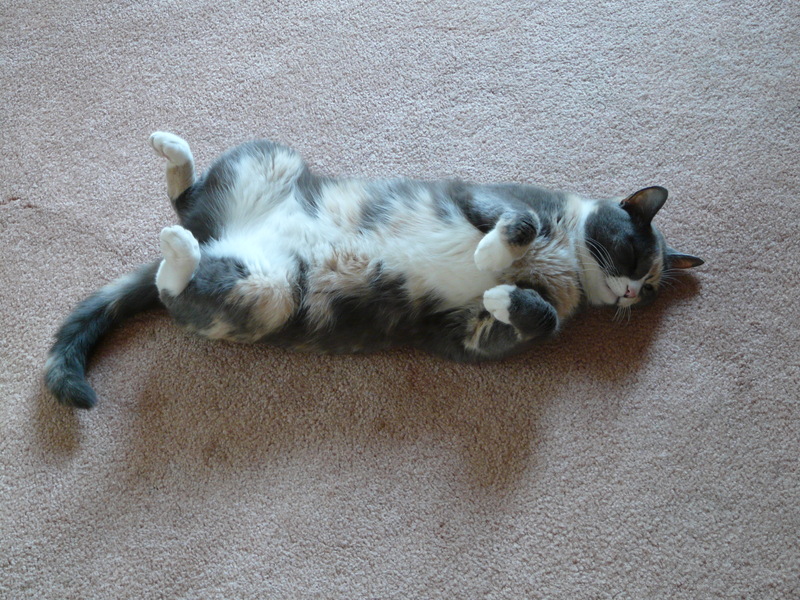 And Cora had tuna water. And it was good. It was overcast and only 70 degrees when we went out this morning. It was sunny and 90 two days ago. Instead of trying to avoid as much sun as possible, we walked around the defunct horse farm. They keep it mowed so it was an easy walk. We walked down the side drive, then over to the track. There are weeds now and grass is trying to sneak in. We took the long way around and came through the barns on the way back. It was so enjoyable to walk at a good pace without sweating. The bushes around the pond have really grown. Sweetums mentioned that there were fewer geese than in the past. I wonder why. Maybe next time, I’ll check for fresh fox holes. When we got back, I had my usual aches and pains. But it’s hours later now and my toes still hurt. It’s so weird. I’ve made good progress on my shawl. Sometimes I get a little lost and have to backtrack. I keep losing yarn overs and trying to pick them back up when I purl back can be aggravating. There have also been times when my end of the row and the directions end of the row did not coincide. So I just fudge it. 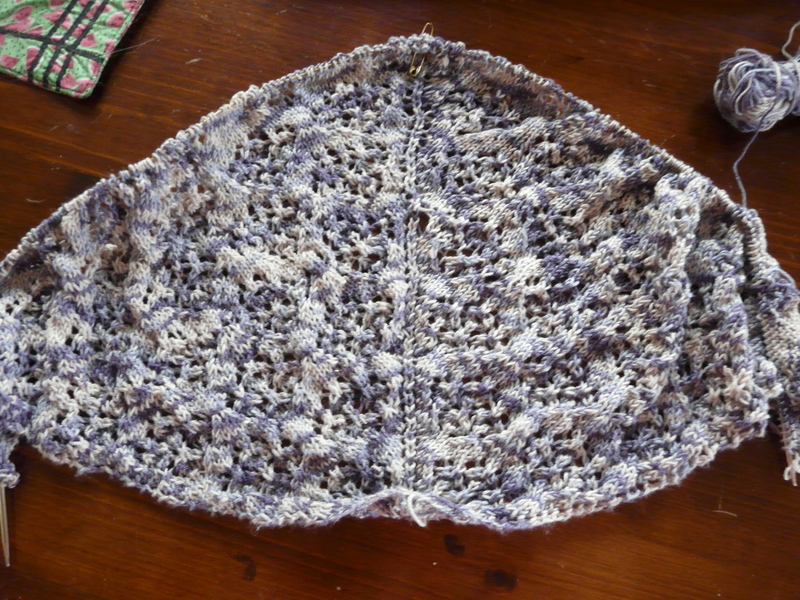 It is one of the joys of using variegated yarn. I do have one obvious hole that I have no idea how it happened. I haven’t decided if I will fix it yet. Well. Not really. She’s going to be a grandmother for the first time. She is a nice person and she is my friend. The pattern is from the new Jane Austen summer magazine. On the first read through, I felt that some exclamations went too far and others just didn’t make sense. I was happy that it had charts and I made good use of my stickies with the arrows on them. I liked the hem around the face, but I did it my way. 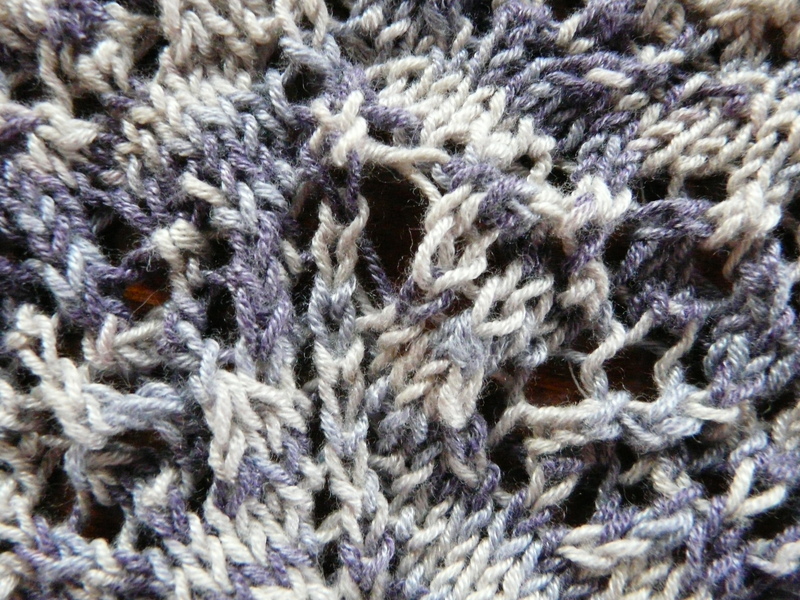 It took less time, used fewer needles, left no more ends to weave in, no waste yarn was needed and it looks perfect. I also liked the I-cord around the neck, but here again, I did it my way. It was quicker and less fiddly and looks just as good. I thought the drawstring idea was great. I couldn’t find the little thingy I use to hold the end, so I used Sweetums instead. Sometimes you just have to improvise. I tried to get one of the cats to model, but the girls were having nothing to do with it. 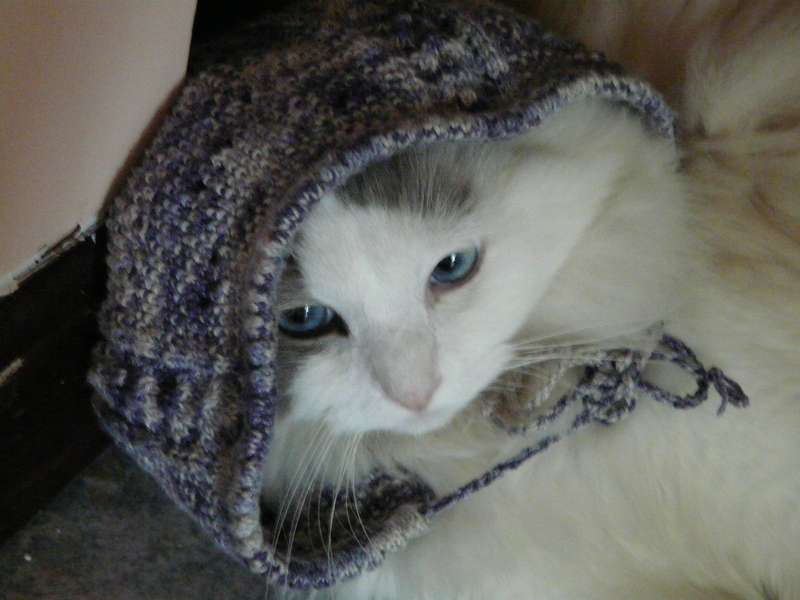 I put it on Sweet Baby Rue while he was half asleep (his usual state). Since I couldn’t get a decent shot, I put it on the glass head. One more thing. You only need about 190 yards to make the bonnet. The directions mention a 547 yard skein which I thought was outrageous amount. If you bought the exact yarn mentioned, you would have a good 2/3 left. I have noticed that a few other patterns have a lot more yardage in them then I would have thought necessary. But he’s much better now. On our morning walk Tuesday (two weeks ago), we had to turn back before reaching the end of the block. By Wednesday night, he couldn’t make it to the bathroom without stopping to catch his breath. When I went to bed, I decided that he would be going to hospital as soon as I was up. Instead, he woke me up at 4AM. He wanted to go. Is it possible to be anxious and happy at the same time? I let the dog out to pee, checked dog and cat chow and water bowls, and got myself dressed. I helped Sweetums into shirt and pants and slippers and off we went. Ten minutes later, we were in the hospital. There were two other groups there waiting, but everything moved along quickly and he was in a bed with oxygen and IV in no time. The ER doctor was very efficient (and nice) and asked a million questions. He heard a heart murmur and began setting up various tests and x-rays. Our family doctor came in around 7AM and said he was surprised to see him here. There’s never anything wrong with him. He listened to him and said he was 99% certain it was pulmonary embolism (blood clots in the lungs). So then came another barrage of questions. All replies were negative. As a matter of fact, his daily walks should have helped in preventing it. Well, enough of that for now. Things to do. 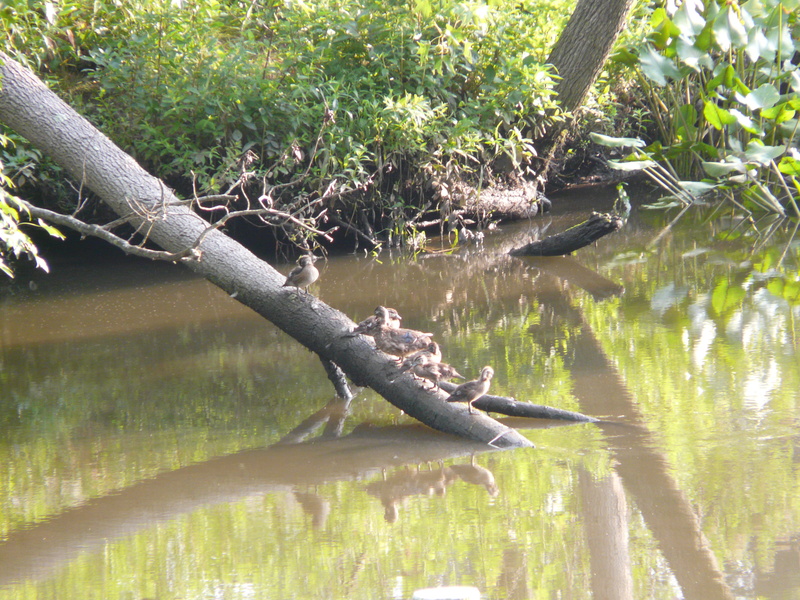 Here’s a picture of mother wood duck and her kids that I took early this morning.